THIS IS MY MESSAGE FOR YOU-OU-OU | jeni a. So I'm learning - there are some things I shouldn't worry about. Like, where we'll attend law school. That'll be the day of change, and heaven knows that I like to be prepared for such change. Moving and re-settling... I'll be able to meet them with dukes up, right? Or if my garbage genuinely decomposes and disintegrates. I throw a full-to-bursting garbage bag into ginormous dumpsters in my parking lot. Nearly weekly. Dear Earth! How are you truly? And, oh so honestly, when will our next baby really come? You can bet that our next home, wherever it is, will be full of light inside - but outside the climate and culture may be dreary. You better believe that I recyle every recyclable thing around here - but those diapers! And you can trust that I'm caring for my body and spirit in prep for baby better than ever before - but? So I'm learning - my best part is my only part, and it's a great one. My influence on what I care about is good enough. And the leftovers? I shouldn't worry about them. 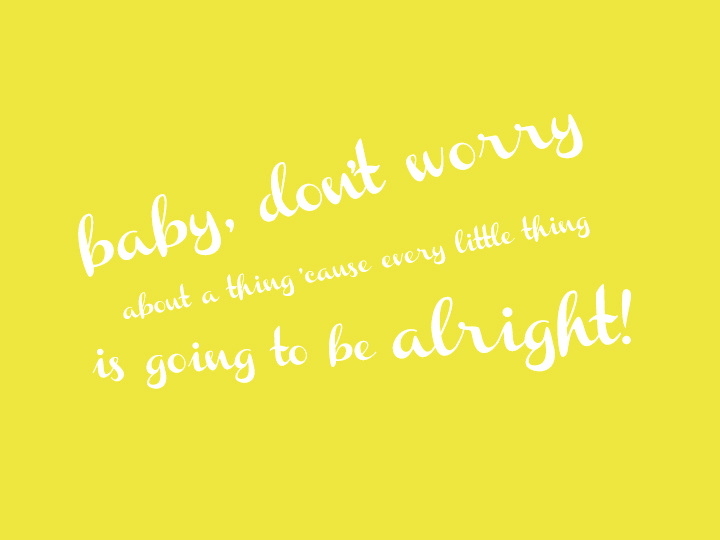 You know I've been singing it...baby, don't worry 'cause every little thing is going to be alright! Before we moved to Kansas a year ago, we lived in Lincoln, NE. There were A LOT of law school families in our ward and almost all of them lived in the same apartment complex! Although I don't know anything specific about the law school, if you want an almost Wymount like experience you could think about the University of Nebraska-Lincoln. :) And if you are seriously thinking about going to school there, this is where they lived. http://www.lexingtonridge.net/LRA/ Lincoln really is a nice town. We loved it there! Jeni! I feel you girl. Going through similar emotions with law school applications. Can we just know already?!? Oh my! Love you! Telllll me about it. Seriously cannot wait to talk with you more about this. xoxo! Lacey - you're a saint! If we're ever in Columbus, count on us crashing your place. And I agree with you about this world being good wherever you go with your fam. Ah! Can't wait to see where we end up. jen... law school applications are CRAZY aren't they? aw hang in there babe. love you! It's all going to work out just right. I know it! Jeni you always find the positive side to things. I have always admired you for that through out high school and even till now! I felt the same fears when my husband entered the Navy, but I have fallen in love with a place I never knew literally on the other side of the country! You guys will do amazing no matter where you go!